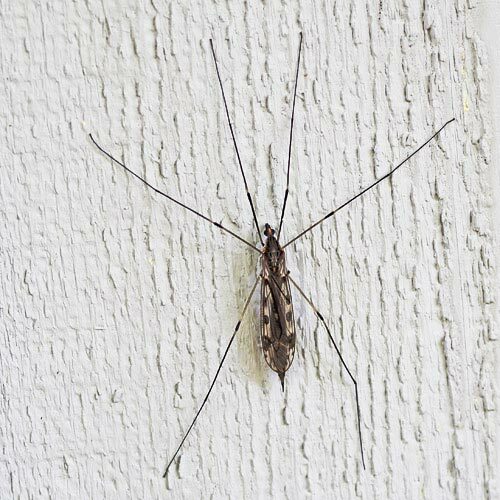 Most BugFans are familiar with crane flies (those giant, non-biting “mosquitoes” in the family Tipulidae) (keep an eye out—some of the fall-flying Tipulids are pretty spectacular). Phantom crane flies belong in the small family Ptychopteridae (only three genera). Crane flies of both families were named for their long legs, and most authors attribute the “phantom” part of the name to the way PCFs drift through the air, appearing and disappearing in patches of light and shadow. Our PCF (Bittacomorpha clavipes) can be seen east of the Rockies, from late spring to early autumn, in the fairly dense vegetation along the shady edges of wetlands. They aren’t huge. If you join the tips of your thumb and forefinger, you’d be approximating the leg-span. 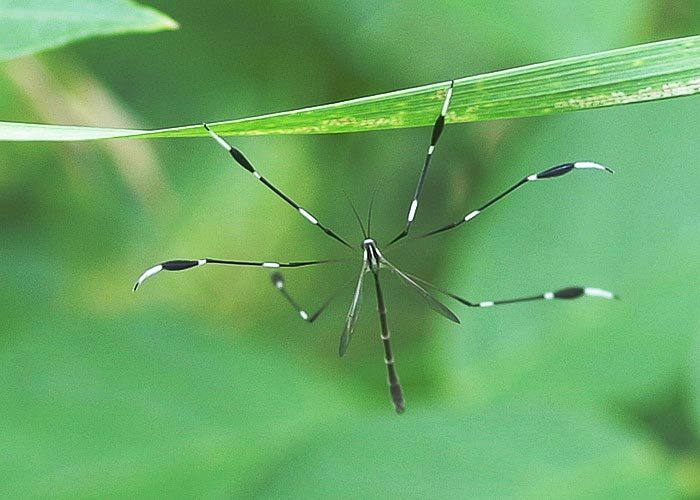 They’re like a flying daddy long-legs, but without the bulk—a PCF body is a slender half-inch. Sources describe them as floating through the air, legs spread, flapping their wings minimally, assisted aerodynamically by the flared areas on their legs. Can they fly up-wind? Yes, if the breeze isn’t too strong, but most of the time, they appear to move randomly through the vegetation, two or three feet off the ground, ricocheting off of leaves. Let’s “unpack” the trachea-tarsomere thing. The tarsus is the lower part of an insect’s leg—its foot—located below the tibia. It’s made up of a series of small segments (usually five) called tarsomeres; the top segment is called the metatarsus, and the bottom segment usually bears a claw or two. The insect walks or hops on its tarsus. Insects breathe largely by diffusion; their respiration is mostly passive (although muscle contractions can push air through the respiratory system more quickly). Air floats through openings called spiracles into tubes called trachea. It moves through a network of increasingly minute respiratory tubing that divides and subdivides and ends in moist pockets called tracheoles where the cells can exchange waste gases for fresh. Trachea may be strengthened by spiral fibers called taenidia that are embedded in their walls; taenidia have been likened to the coils in a dryer vent tube. In the absence of taenidia, a tracheal wall may bulge out like an aneurism and form an air sac. In both sexes, the metatarsi are very much enlarged and quite conspicuous on account of their great color contrast. The whole tibia is completely filled up by the trachea. In the enlarged metatarsus, the trachea is enormously distended and almost completely fills the cavity of this joint as well as that of the second and third joints of the tarsus.” In Tipulidae, the tracheal tube is delicate-to-obsolete in the tarsus. “it is impossible that they [immense vesicles in the metatarsi] should be used as reservoirs for air for respiration, on account of their distance from the body of the insect. It is more probable that they may bear some relation to the insect’s method of locomotion. When flying, Bittacomorpha uses the wings scarcely at all, relying in great measure upon wind currents for transportation. 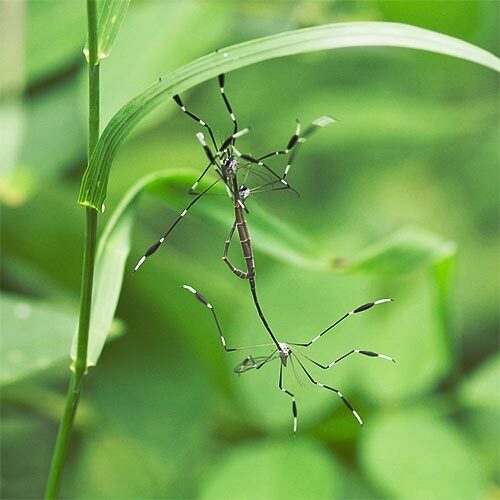 The legs are exceedingly light, as the exoskeleton is light and delicate, and encloses practically no tissue that can serve to increase their weight. As they expose a large surface, they offer great resistance to the air without adding appreciably to the insect’s weight. So, the hollow legs lighten the insect, and the inflated sacs increase buoyancy and provide surface area for the wind to push on. How do PCFs get away with their striking, black and white patterns? Aposematic/warning coloration has been suggested, but the folks who keep track of these things tell us that the rest of the crane flies taste OK, and there’s no reason to suspect that PCFs taste otherwise (the aquatic larvae scavenge on organic detritus in the water that surrounds them, and the adults eat little or nothing—they’re not blood suckers!. Nothing suspicious there). As previously noted, black and white coloration is a good plan for an animal that inhabits the light-speckled thickets, and the BugLady assumes that they’re as tough for predators to see as they are for photographers. 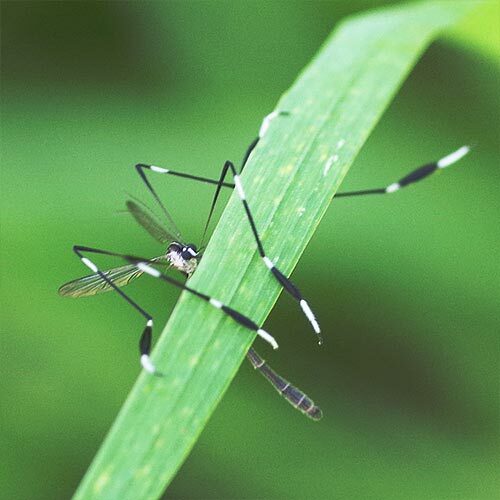 A blogger in Michigan suggests that Crane fly legs are oh-so-easily detachable, and that the PCF may sacrifice a conspicuously-striped leg to save its life. If the BugLady were to pick an adjective, it would be “flickering,” and she thinks they look like tiny sparklers. The BugLady was lucky enough to witness a few happy PCF couples flying around in tandem. Both in flight and when hanging from a leaf, the female provides the muscle. Twice, as the BugLady was (voyeuristically) photographing a mating pair, a third PCF flew in and hassled the female. Subsequently, the female dips the tip of her abdomen into the water, depositing eggs (as many as 300 of them) singly or in small bunches. The larvae live in the top inch or so of muck and feed on decaying material they find there. It’s not exactly an oxygen-rich environment, and although they can pick up gases through their soft exoskeleton, they get the bulk of their air through a long, retractable breathing tube (caudal respiratory siphon) that they extend up through the surface film from the rear of their body. According to Voshell in A Guide to Common Freshwater Invertebrates of North America, the larvae “burrow deep into sediment during periods of the winter when the water freezes over. Pupation occurs in the same habitat where the larvae develop, without any special preparation. Pupae have long, breathing tube on the thorax.” There are reportedly two broods in the northern part of its range. PCFs have been putting on small but exquisite performances since Eocene times, and they’re now showing at a wetland near you! On another note—the BugLady has been enjoying the sweet serenades of the tree crickets recently. Here are links to two audio sites from last year’s BOTW on tree crickets, turn up the volume on your speakers, and scroll down slowly. And, try the U of Florida’s recordings of crickets and katydids north of Mexico. Fair warning—you have to listen pretty hard to hear some tree crickets.